In our last post, we talked about developments of smokeless powders in France, leading to the invention of Poudre B smokeless powder. In today's post, we will study about another smokeless powder that was developed in France as well, but it wasn't developed by a Frenchman. Instead, it was developed by an Swedish inventor who happened to be living in Paris at that time. We will study the invention of Ballistite. The Swedish inventor we are talking about is Alfred Nobel, who was a prolific inventor and was well known for inventing dynamite (and later, founding the Nobel prizes). Alfred Nobel's father, Immanuel Nobel, owned an armaments factory and Alfred and two of his brothers, Ludvig and Emil Nobel, were all interested in manufacturing better armaments and explosives. 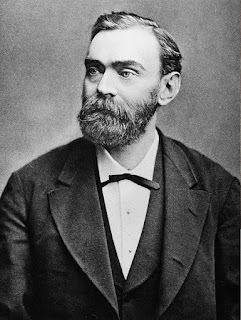 Alfred Nobel devoted a lot of his time to studying how to manufacture explosive substances safely and invented (among other things) a detonator, the blasting cap, dynamite, gelignite etc. These inventions (along with shares in the largest oil refinery in Russia, which was founded by his brothers, Ludvig and Robert) made him a very rich man and in 1873, he bought a large mansion on Avenue Malakoff in Paris and moved there. Despite his riches, he did not forget his interest in chemistry and still continued doing research in his laboratory. It is not known exactly how he discovered how to make ballistite, but from his notes, it appears that he had been working on and off to make a smokeless powder since about 1879. He experimented over many months with various acids to make many explosive prototypes, which he tested at a blasting range outside Paris and then worked with assistants to perfect the manufacturing process. He didn't keep very many detailed notes mainly because of the need to protect trade secrets from competitors. 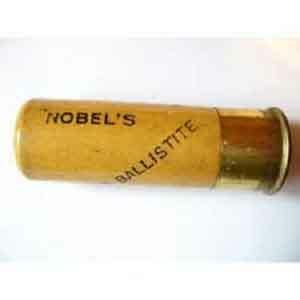 In 1887, a few months after Poudre B was accepted by the French government, Alfred Nobel submitted a patent application for his own smokeless powder, which he called "ballistite". According to his patent application, this was a combination of equal parts of nitroglycerin and nitrocellulose "of the well known soluble kind", with about 10% camphor. The exact wording on the patent application would come back to haunt him, as we will see in our next post. The purpose of the camphor was to react with any acidic products formed by the decomposition of the other two explosive substances. The camphor helped stabilize the other two substances from further decomposition and prevented explosions. In his 1887 patent application, Nobel wrote, "Celluloid, as a rule, contains nitrated cotton to approximately two-thirds of its weight, but owing to the camphor content and substance's compact consistency, celluloid's combustion, even if fine-grained, is far too slow to make it suitable as a propellant for projectiles. By substituting nitroglycerin, wholly or in part, for camphor, it is possible to produce a kind of celluloid with sufficient consistency to be formed into grains and which, on being loaded into firearms, burns with a subdued rate of combustion." Like the Poudre B that we studied in the previous post, ballistite is also a substance that burns with much more force than black powder, but produces very little smoke and residue as well. Like Poudre B, it is also a plastic that can be shaped like dough and cut into precisely shaped and sized grains to fit the needs of everything from the smallest pistol to the biggest cannons. So when Alfred Nobel triumphantly presented his latest invention to the French military in 1887, he was surprised to be rebuffed. It turns out that the French had just settled on using Poudre B a few months earlier in 1886 and Paul Vieille's political connections ensured that Poudre B would be used by the French military even though ballistite was a superior product. Nobel angrily wrote that "for all governments, a weak powder with strong influence is obviously better than a strong powder without this essential complement." Nevertheless, he went about marketing his invention to other countries and on August 1st, 1889, he obtained a contract from the Italian government and opened a new factory in Turin where he manufactured about 300 tons for the Italians. The next year, he licensed his patent to the Italian government for a large sum of money, so that they could manufacture it by themselves. The Italian army, in turn, replaced their old black powder rifles and adopted a new M1890 Vetterli rifle which used ballistite cartridges. During that period of time, France and Italy were competing with each other, to become great powers in Europe. Naturally, the news that a person living in Paris and helping their enemy with manufacturing superior cartridges did not sit very well with the French public and military. The French newspapers launched a series of articles attacking Nobel's character, accusing him of treason (despite him offering ballistite to the French first and living in France for 17 years) and claiming that he had spied on Vieille and stolen his recipe for ballistite from the laboratories of the French Administration des Poudres et Salpetres. The police conducted a search on his laboratory and shut it down, his testing range permit was revoked and he was prohibited from manufacturing ballistite in France. Therefore, in 1891, Nobel packed up his possessions from his mansion in Paris, along with any laboratory equipment that hadn't been seized, and moved everything to San Remo in Italy, where he bought a large house that he named Villa Nobel. He also built a laboratory close to his new house and continued experimenting there for the rest of his life. It must be noted that the production process of ballistite involved making flexible sheets, which were cut into flakes in cutting machines, or in pastry cutters, or squirted through gratings to form threads. It was a curious fact that many machines that were originally used in Italy to make bread, pastries, pasta, spaghetti and macaroni, were now employed in the manufacture of smokeless powders! Italy wasn't the only country that Alfred Nobel was marketing his invention to. In the next post, we will study how he accidentally helped Britain to make their own smokeless powder. In our last post, we studied some developments in powder technology advancements in France. In today's post we will study some further developments in the field. Image released under the Creative Commons Attribution-Share Alike 3.0 Unported license. In the case of classic black powder, the powders are made of a mixture of charcoal, potassium nitrate (saltpeter) and sulfur and made of individual grains. They can be made to varying densities by refining and compressing them, which we studied in several previous posts. However, there are still spaces in between the grains and these interstices cannot be completely got rid of in conventional black powder. Therefore, no black powder really burns according to Piobert's law of parallel layers -- for this to happen, the black powder needs to be a homogeneous mixture without these spaces between the grains. However, Vieille didn't just study black powder, he also extended his study newer explosives (including gun cotton) as well. Due to his studies, he now understood why gun cotton's fibrous structure caused it to burn much more quickly in a barrel than black powder and why it produced much more force. He understood that if he could somehow reduce the combustion rate of gun cotton, then it could be used as an excellent propellant for firearms as well, and to do this, he would need to change the structure of the gun cotton fibers, so that he could enable it to burn in "parallel layers". His idea was to convert the gun cotton into a "powder", not like black powder which has gaps between the grains, but more like a homogeneous material whose geometry could be modified by the manufacturer to burn at a precise rate in layers. His method was to dissolve the gun cotton in a mixture of alcohol and ether, stabilize it with amyl alcohol and form a colloidal paste. This colloidal paste could then be passed through heavy rollers to make thin sheets of precise thickness, extruded into rods, molded into plates etc. and then dried and cut into flakes of precise shapes suitable for the ballistic requirements of any particular firearm or artillery piece. All this development took place between 1882 and 1884 and the first practical results came out in 1884. A sample of Poudre B. Click on the image to enlarge. The first version of this new propellant was called "Poudre V". The word "Poudre" means "powder" in French and the letter "V" at the end stood for the name of its inventor, Paul Vieille. However, the French military were concerned that the Germans might find out details about this new invention and therefore, they arbitrarily changed its name to "Poudre B" so that the inventor's name would no longer be in it. Some claim that the name stood for "Poudre Blanche" (i.e. white powder), to distinguish it from black powder (note that Poudre B is not white colored either, it is actually a dark green and gray color), but the real reason for renaming it was to confuse German spies. The French military quickly adopted this powder and they also developed a new rifle for this, the 8 mm. Lebel rifle, in 1886. This was the first military rifle to use smokeless ammunition. The Lebel rifle was a game-changer on the battlefield. First, it had longer range and a flatter trajectory than other rifles. Since the ammunition produces much less smoke, a soldier could stay hidden from the enemy, but locate them by observing the smoke from their black powder rifles. As the new propellant was three times more powerful than black powder, the cartridges weighed less for the same performance, which meant the soldier could carry more of them. The Lebel could also fire at the faster rate of 43 rounds a minute, compared to 26 rounds for the black powder M84 rifle of the German army. This is one reason why Otto von Bismarck opposed invading France in the winter of 1888 when his war minister Alfred von Waldersee wanted to go to war. Other foreign powers learned that the French possessed a new propellant by 1886 after the Lebel rifle was accepted into military service. German spies were able to obtain a sample, but could not identify its components or manufacturing process. In 1890, the British managed to obtain some small tablets of Poudre B and picric acid and identified the compounds that form the basis of it. Quickly, the knowledge of its composition spread to other countries as well and they began to manufacture their own smokeless powders as well. It must be mentioned that Poudre B still had some stability issues, especially when stored for long periods of time, due to the improper removal of acid during their manufacturing process. This caused two French warships, the Iena and the Liberte, to blow up in 1907 and 1911. Meanwhile, the process of manufacturing Poudre B had made improvements and newer versions (such as Poudre BF and Poudre BN3F) were invented by the early 1900s, which were much safer than Poudre B. In fact, the French used a variant called "Poudre BPF1" until the 1960s or so. In our last post, we looked into the development of Schultze powder, one of the first smokeless powders. Today, we will look at developments in France at around the same time. "in the present state during which, various attempts made by the Artillery and the various chemists and industrialists in the preparation of these products, there is no need to continue experiments with regard to their use in weapons of war." The instability of gun cotton, as seen by unexplained explosions of stored gun cotton. We now know that this instability was caused by presence of acid residues in the gun cotton, which act as catalysts for decomposition of the gun cotton. The combustion behavior of gun cotton, which caused higher pressures and was responsible for weapons exploding and causing accidents. In France, they stopped research into gun cotton and studied other substances like picric acid instead. Meanwhile, as we saw in an earlier post, an Austrian officer, Baron Von Lenk, worked on solving the problems of gun cotton and discovered a process that enabled him to produce large quantities of gun cotton in 1862. Nevertheless, the Austrians also stopped production within a few years, due to explosions inside the two factories that produced their gun cotton. 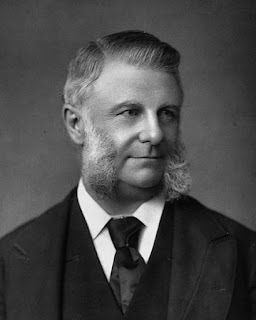 Some more improvements in the production process were made by the British chemist, Sir Frederick Abel, but there was an explosion in the factory at Stowmarket in 1871 and from then on, they only used gun cotton for underwater torpedoes and mines. In France, they also started production of gun cotton for use by the French Navy in 1873, for torpedoes and mines as well. The factory was in Moulin-Blanc near Brest, in the Brittany region of northwestern France, and it produced gun cotton using the methods pioneered by Abel. While the British discoveries had paved the way for safer manufacture of gun cotton, the problems of ballistics was still an obstacle to adoption for use in armaments: gun cotton burned too fast and weapons burst due to over-pressure. As one report of that time put it, "Rifles that support 30 grams (1.05 oz.) of black powder, burst with only 7 grams (0.25 oz.) of gun cotton. With a load of 2.86 grams (0.1 oz.) of gun cotton, rifles become worn out or unusable after 500 shots, whereas it takes 25,000 to 30,000 shots with ordinary black powder." It was known at that time (thanks to the work of Captain Thomas Rodman of the United States Army) that greater performance could be obtained by powder that burned slower with gradually increasing pressure, than with powder that burned violently in a short period. This is why many experiments were done to reduce the rate of combustion, such as the 1865 development of a smokeless powder by Colonel Schultze in Germany. This was later improved by Frederick Volkmann of Austria, who improved the Schultze process and came up with a powder called Collodine. This was manufactured between 1872 and 1875, but the factory closed down in 1875, due to an Austrian state monopoly on powder manufacture. Some other similar powders were also made in the US (Reid in 1882). Most of these powders found some success as hunting powders. One of the attempts to reduce combustion rates led to the production of prismatic powders, but this was only a partial success, because even when compacted properly, it didn't always burn progressively. Additionally, prismatic powder being a black powder, it produced a lot of smoke and residue. Meanwhile, the hunting powders in the paragraph above had the same issue of not burning evenly as well, due to lack of a consistent shape and uniform composition of the material. It was in the 1870s that the French government decided to form a committee to study of the fundamentals of the combustion process of powders. The objectives of this group were to predict the ballistic behavior of a projectile from the characteristics of the explosive material and the weapon used. To do this, it was necessary to understand the process of combustion of the powder, the formation of gases at various temperatures and pressures, the movement of the projectile in the barrel and the its trajectory in the air etc. Such an analysis is very complex and it involves numerous subjects and disciplines that were not yet well understood in the 19th century: chemical thermodynamics, ballistics, mechanics of explosive reactions etc. Way back in 1839, a French General named Guillaume Piobert had studied the combustion process of black powder and theorized that "burning takes place by parallel layers where the surface of the grain regresses, layer by layer, normal to the surface at every point." He concluded that combustion rates of the powder is affected by the layers and pressure has no effect on the combustion rate. We now know of this discovery as Piobert's law and it applies to solid propellants in general (not just black powder), but when he first proposed it, it was a very controversial theory. 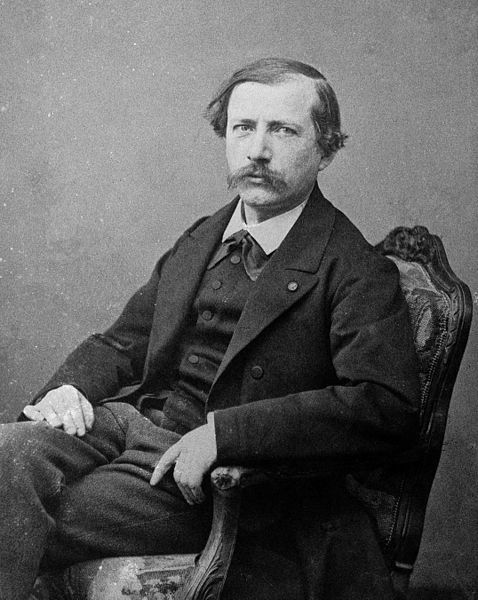 In the light of new discoveries made since, the French decided to revisit his work in the 1870s. 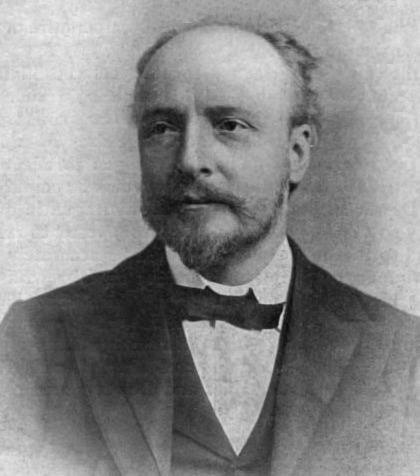 A famous French chemist named Pierre Eugene Marcellin Berthelot had already conducted several studies on chemical thermodynamics and explosions and he was appointed head of the French explosives committee. In his group were a couple of people, Emile Sarrau, the manager of the French Depot Central des poudres et salpetres, and his new deputy, Paul Vieille, then only 27 years old and a recent university graduate. Sarrau and Vieille were tasked with the study of an apparatus called the crusher manometer (or crusher gauge), which was used to measure explosive forces. The device was invented by a British officer, one Captain Andrew Noble in the 1860s and he published a research on explosives along with the above mentioned Frederick Abel. Crusher Manometer invented by Noble and Abel. The Noble apparatus consists of crushing a small copper cylinder placed between a fixed anvil and a moveable piston and calculating the maximum pressure by measuring the deformation of the cylinder and comparing it against similar copper cylinders compressed under known loads. We already studied this process a few years ago, when we studied how chamber pressures were measured. However, this process only gives approximate results, because there wasn't an accurate way to produce standard cylinders to measure against. It was possible to subject two identical cylinders to the same pressure and end up with different amounts of deformation. So Sarrau and Vieille began to improve the process of producing standard cylinders to measure against. They invented two methods to do so: in the first method, the cylinder was crushed slowly, until it bore a predetermined weight without further deformation. In the second method, a counterweight was moved slowly along the arm, with the aim of uniformly increasing the load supported by the copper cylinder, from zero load to a predetermined value. However, the crusher gauge only showed the maximum pressure of the explosion. In 1882, Vieille also invented a mechanical device to record the pressures generated over time for an explosion. His invention was a modification of the crusher gauge: he attached a pen to the piston, so it would produce a mark on a cylinder which was turning at a known speed. With this piece of equipment, he could measure the pressure curve of an explosion as well. Vieille and Sarrau proved by the study of the crusher gauge, that explosives must be classified into two categories: that which have slower rates of combustion (low explosives) such as black powder, and those that have a fast rate of explosion (greater than speed of sound, i.e. high explosives) such as gun cotton and picrates. They found that previous studies on the maximum pressures of explosives were not quite correct because the height of the crushed cylinder depends on the piston mass and the speed of combustion. They developed rules and procedures to give exact measurements of maximum pressures generated by explosions and within the next few years, Vieille would use some of these studies to develop a new type of smokeless powder. We will study how that happened in the next post. In our last post, we studied some discoveries by Baron Von Lenk, who succeeded in developing a process to manufacture gun cotton in larger quantities. The Austrian empire adopted his gun cotton as a propellant to replace black powder and supplied thirty howitzer batteries with gun cotton cartridges, as well as a new model of the Lorenz rifle (the M1862 model) to use gun cotton. Two factories in Austria started to manufacture gun cotton based on his process. The gun cotton, as made by Von Lenk's process, retained the fibrous nature of the original cotton. The Austrians spun it into threads and braided them together, or wound them on wooden or paper bobbins, and arranged them in cartridges, so as to secure the desired air gaps in between and insure proper ignition. The Austrians found that this propellant was not affected by dampness, only required a charge of 1/4th to 1/3rd of the amount of black powder previously used, left less residue inside the barrel, produced less smoke and the gases evolved were also less harmful to the weapons and the men around them. France and England got interested in his discoveries and sent scientists to study the Austrian process as much as they were willing to reveal and Von Lenk also lent his expertise to scientists from both countries. Unfortunately, there was an accident in 1862 in the factory at Hirtenberg, Austria, which blew up for some unknown reason. Soon after this, a British company called Thomas Prentice & Co. started to manufacture gun cotton in 1863, in a town called Stowmarket in England. Shortly thereafter, Sir Frederick Abel also began to research producing nitrocellulose safely at the Royal Gunpowder Mills at Waltham Abbey, England. His process was based on Von Lenk's process as described in our previous post, but he effected a more complete purification of the gun cotton by pulping it before the final washing process, thereby cutting the tubular fibers into short lengths and rendering it possible to remove the last traces of acid retained within the tubes by capillary action. Traces of acid remaining in the gun cotton was what caused it to decompose over time. He patented this method in 1865, just around the time that the second Austrian factory also blew up. The Austrians had also had some accidents with their guns and after the second factory blew up, they decided to stop using gun cotton in their military. Meanwhile, Abel continued to experiment in England with his pulped, purified gun cotton, which he could compress into various shapes and in 1867 and 1868, he got some very promising results when used with field artillery. However, the British military were still very wary of gun cotton and military authorities were concerned about safety issues more than the advantages of the smokeless powder technologies. Also, the Thomas Prentice & Co. factory in Stowmarket blew up in 1871 and this was another reason why the British military discontinued further research for artillery and small arms for about twenty years. Instead, the compressed gun cotton was used in naval mines and for filling torpedoes and this is where the entire gun cotton production at the Waltham Abbey factories went to for the next couple of decades. While military interest in gun cotton had decreased, civilians were very interested in this new technology. In particular, sportsmen who liked to hunt, appreciated the lack of smoke combined with higher velocities and lack of fouling and the next few years of developments were largely done in response to their demands. Naturally, the goal was to reduce the force of the explosion, so that barrels would not rupture, as had happened in the previous years. Around 1863, a Prussian artillery officer, Captain Johann Edward Schultze, invented a powder made from well purified and partially nitrated wood. His process started by sawing the wood into thin sheets about 1/16th of an inch in thickness, which was then passed through a machine that punched out disks or grains of uniform size. The next step was to remove the resinous matter from the disks, which was done by boiling the disks in sodium carbonate solution, washing them, steaming them, bleaching them with chloride of lime and then drying them. After this, the cellulose was nitrated in an acid mixture similar to the Von Lenk process. After this, the nitrated wood was then steeped in a solution of potassium nitrate and barium nitrate and then dried, which completed the process of manufacturing process. Using this process, the nitrocellulose that was produced was diluted with unconverted cellulose and metallic nitrates, which allowed for an even rate of combustion. The advantage of using nitrates and organic substances as diluents was soon copied by other people and many other powders were soon on the market, using potassium, sodium and barium nitrates, and potassium nitrate (saltpeter), while sugar, cellulose, charcoal, sulfur, starch, gums, resins and paraffin were all used as combustible diluents and cementing agents. Schultze started manufacturing his smokeless powder in a factory in Potsdam, near Berlin, around 1864. His powder soon gained popularity among civilian hunters. However, in 1868, there was a major fire in his factory and it burned to the ground. Shortly after this event, over in England, near a town called Fritham in the New Forest area, at a site called Eyeworth Lodge, a new factory called the Schultze Gunpowder Factory was established by two businessmen, Clement Dale and William Bailey. There was already an earlier attempt about 7 years previously to establish a black powder factory at the same site, which was not successful. The new owners hoped to capitalize on smokeless powder technology as well as the name of Captain Schultze, from whom they obtained a license to manufacture the powder. 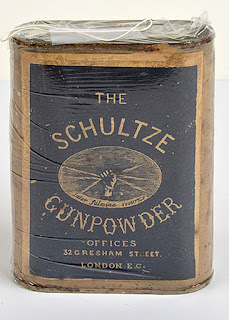 It must be noted that while Captain Schultze was not really directly involved with the new Schultze Gunpowder Factory, they did use his original manufacturing process and subsequently improved it over the years as well. "Here and there at intervals wide apart are various buildings of light structure from one of which rises a tall chimney instrumental in raising steam to drive a 10HP sawing machine which rapidly creates the "wood powder". This is subjected to chemical washing leaving hardly anything behind save pure woody material, known as lignine or cellulose. The next operation involves the conversion of these cellulose grains into a sort of gun cotton material by digestion with a mixture of sulphuric and nitric acids. Next it is washed with carbonate of soda and dried. The resultant grains are stored away until the time of packaging and dispatch when they are charged with a definite percentage of a nitrate powder -- nitrate of baryta is preferred. All the buildings requisite for manufacturing this explosive are cheap and flimsy so that if they did catch fire no loss would ensue. The plant and machinery is of small cost in comparison to that used for making black gunpowder and Schultze wood powder is sold at a price commensurate with its cheap production." In 1874, a talented self-taught chemist named R.W.S. Griffiths was appointed as the general manager and he refined the production process. Soon after this, the company began to become famous for the quality of its powder, particularly after samples of powder were successfully tried out in a series of trials organized by The Field magazine. By 1878, it became a leader in the world's sporting powder market. Many of the famous cartridge manufacturers, such as Eley Brothers, Kynoch and Union Metallic Cartridge Co. (UMC), used Schultze powder in their cartridges. The company rapidly expanded and the population of the local village of Fritham expanded with it, causing a reservoir, a new church, a store and workers houses to be built. Nevertheless, powder manufacturing remained a dangerous process and therefore, the wages for workers at that factory were around double that of those working in agriculture at that time. At its peak, the Schultze Gunpowder Factory also opened offices in Gresham Street, London and had agents in various cities around the world. They became the largest manufacturer of smokeless powder for sporting use and produced about 75% of the world's supply. In 1897, they formed an American branch in conjunction with E.C. Gunpowder Co. and called it American E.C. & Schultze Gunpowder. One of the most famous users of Schultze powders was the legendary American exhibition shooter, Annie Oakley, who was the star of Buffalo Bill's Wild West Show. 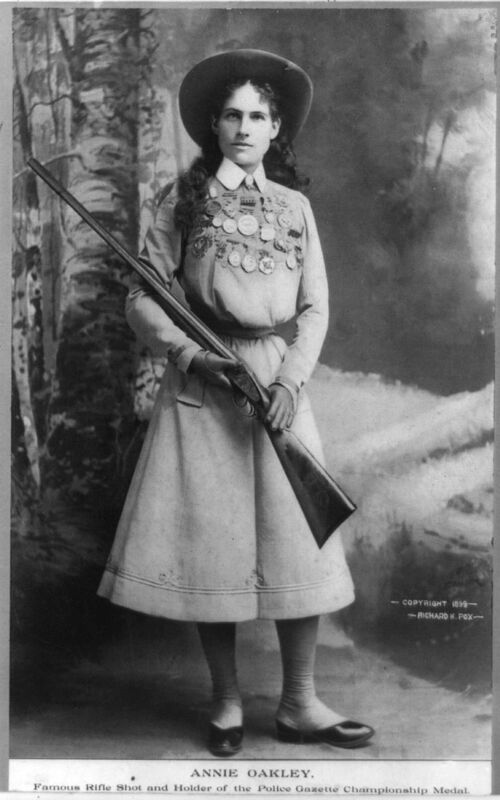 The legendary Annie Oakley. Click on the image to enlarge. Public domain image. 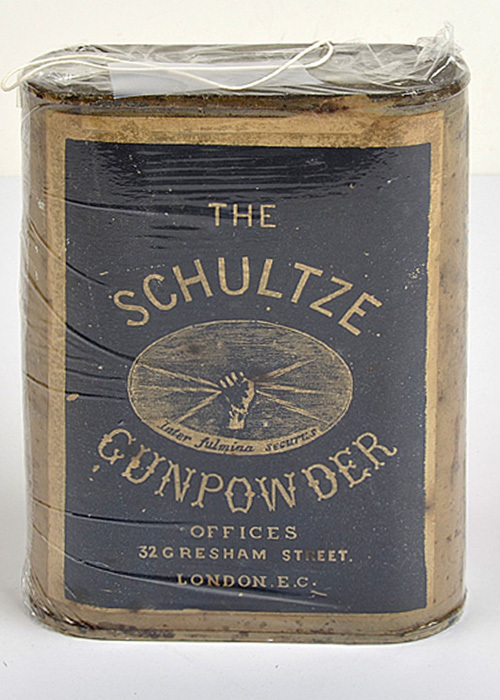 Annie Oakley had mentioned in several interviews, that she only used Schultze powder for her performances. Interestingly, when the Wild West Show toured France in 1889, she brought along fifty pounds of Schultze powder with her and then discovered at the dock that there was a French law that forbade the import of foreign gunpowders! At that time, the quality of French powders was not as good, because of a government monopoly on powder manufacturing and she didn't have the time to experiment with a new brand anyway. Fearing that her accuracy would be affected, there was only one thing she could do: smuggle the powder in! She obtained five hot-water bottles and enlisted four other lady riders with the show as co-conspirators. They filled the hot-water bottles with Schultze powder and each woman wore a dress with a bustle, hiding the bottles within. In fact, Annie had never worn a bustle in her life before that day, but she admitted that on this occasion she was glad to do so. She led the women safely through the customs line and into France. As she later admitted, "We sure did attract some attention when we went down the gang plank, for although the bustle originated in France, it was going out of fashion at that time". Even then, as the tour went on in France, her supply of powder eventually ran out and her shooting accuracy was affected because she had to use French powder. In fact, the French powder exploded one of her best guns and gave her a big bruise and her husband noted that no matter how carefully one loaded French powder into cartridges, no two ever fired alike. Luckily for her, in Marseilles, she received a notice to go to the Customs House to pick up a box mailed to her by some friends in England. The box was rather large and inside it were two dozen fresh eggs and an unsigned note telling her that she should try the packing material out in her gun before throwing it away. The eggs were packed in Schultze powder! She gladly paid the 40 cent import duty on the eggs and as she reported, "I never shot better in my life than I did the next three days, either winning or dividing every event. It may be that I was in better form, but I'm sure my Schultze load had a great deal to do with my good scores." By the early 1900s, Schultze Gunpowder Company expanded so much that they had to move to Redbridge in Southampton, which was more suitable for transportation of its products. However, the company really suffered during the World War I period due to anti-German sentiment. In fact, the company had to take out newspaper advertisements declaring that despite their German-sounding name, all the owners, management and workers were British! Soon afterwards, a bunch of British powder manufacturers all combined together to form Nobel Industries, which later combined with three other companies in 1920 to form ICI (Imperial Chemical Industries),which was Britain's largest manufacturer for most of its history. This was around the time that the Schultze factory at Eyeworth Lodge was closed. All that remains there today are a few buildings and a farm. In our next post, we will how gun cotton started to attract the interest of militaries once again. 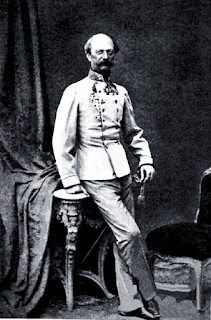 Baron von Lenk in 1866. Click on the image to enlarge. Public domain image. The cotton should be cleansed and perfectly dessicated (i.e. dried out) previous to its immersion in acids. The acids used should be the strongest available. The steeping of the cotton in a fresh strong mixture of acids after the first immersion and partial conversion into gun cotton. The steeping should be continued for 48 hours. The gun cotton should be thoroughly purified afterwards and every trace of free acid should be removed. The process started by spinning the cotton into hanks of about 85 grams (about 3 oz.) each, suspended on hooks in a hot solution of potash. An under-heated iron boiler was used for this purpose, the water in the boiler containing sufficient potash to give it a specific gravity of about 1.022. The cotton was immersed in the boiling potash solution for about 2 to 3 minutes, according to the amount of grease contained in the cotton strands. The potash solution acts as a soap and removes the grease. Then the cotton hanks were put in a centrifugal machine and spun around at high speeds to drive out some of the potash solution (the same idea is used in modern washing machines as well). Then the cotton hanks were put in perforated zinc baskets and swung to-and-fro in pure water to remove any remaining traces of soap, after which they were wrung out again and allowed to completely dry out. This completed the stage 1 of the process, cleaning out the cotton and drying it. The acid mixture was prepared by taking strong nitric acid of specific gravity 1.48 to 1.49 (at 17.5° C or 63.5° F) and strong sulfuric acid of 1.835 specific gravity and streaming them from two taps into an earthenware vessel. The proportion was usually 1 part of nitric acid to three parts of sulfuric acid. The process of mixing the two acids produces heat, so the mixture was allowed to cool in the earthenware jars and stored until ready for use. The nitration process was done in cast-iron dipping pans divided into three compartments, with a grating fitted over the middle one. Two hanks of cotton at a time were put into 300 times their weight of acid mixture in the first two compartments of a dipping pan. The hanks were turned over and squeezed with spatulas until the acid had completely penetrated through the cotton hanks. Next, they were transferred to the grating and squeezed again to free out most of the excess acid, the cotton being allowed to retain about 9.5 parts of acid. When about 2 kg. (4.4 lbs.) of cotton had been treated this way, the acid mixture was emptied out and fresh acid was put into the dipping pan. When six hanks of cotton had been nitrated, they were put into another earthenware pot standing in the third compartment of the dipping pan. A weighted disk was put into the pot to make sure that the cotton was completely submerged in the acid and then the pot was closed with a lid and allowed to stand for between 24 to 48 hours in a special temperature-controlled room, where the temperature was not allowed to fall below 5° C (41° F) or go above 25° C (77° F). In order to maintain the temperature within these limits (remember that air-conditioning technology wasn't really well developed yet), the room had to be heated during winter and the exterior of the pots was cooled by running water in the summer. During the first two to six hours, the pots had to be watched carefully and the heating was prevented either by adding some fresh acid or passing cold water around the pots. After the nitration was finished, the crude gun-cotton was then put into centrifugal machines and spun around again to remove some of the excess acid. Then they were washed with a large quantity of water in copper drums and then finally treated in running water in special washing boxes for six weeks. The gun-cotton was then wrung out again in a centrifugal machine, treated with a boiling potash solution, then again through the centrifugal machine, washed with pure water, through the centrifugal machine once more and then dried. After this, it was dipped into a solution of sodium silicate of 1.072 specific gravity, then a spin cycle through a centrifugal machine again and then finally exposed to the air for three days. During this time, the sodium silicate was decomposed by the action of carbonic acid in the air and silica (or an insoluble silicate) would precipitate on the fibers of the gun-cotton. After three days, the product was again washed in pure water, passed through another spin cycle in the centrifugal machine and then dried in open air, or in a drying house, at a temperature not exceeding 35° C (95° F) and making sure to avoid direct exposure to the sun's rays. While all of this washing and wringing the cotton in the centrifugal machines may seem excessive, it was necessary to do this to ensure that even minute traces of acid were removed from the treated gun-cotton, in order to ensure its stability. This process would yield about 165-167 parts of gun-cotton for every 100 parts of dry untreated cotton. The structure of the gun cotton threads were carefully examined and hanks containing torn threads were discarded. Then, a small portion of the gun cotton was tested for strength and if found satisfactory, the batch was packed. Unlike the processes of previous inventors such as Schonbein, Otto etc., which could only be used to manufacture small quantities at a time, Von Lenk's process could be scaled up to produce large quantities. 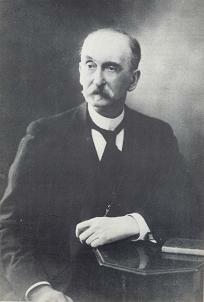 Baron Von Lenk patented his process and was invited to give lectures in France and England detailing his methods. While in France, he was personally awarded the Commander's Cross of the Legion of Honor from Emperor Napolean III and was also given a box studded with diamonds for his discoveries. In Austria, another army officer, Ritter von Lorenz (Joseph Lorenz) was working on the design of a rifle which was first approved in 1854 and subsequently updated in the following years. The version that was manufactured in 1862 used a steel barrel instead of a cast-iron one, in order to use gun-cotton cartridges. The gun-cotton cartridges and the M1862 Lorenz rifle model came to the attention of Dr. Theodore Canisius, the US consul to Austria at that time. Dr. Canisius saw the advantages of gun-cotton over black powder and began to send back regular reports to the State Department about various Austrian experiments with gun-cotton propellants. In August 1863, Dr. Canisius returned to the US with an M1862 Lorenz rifle and some Austrian ammunition samples, and arranged meetings with several key officials (including then Secretary of State, William Seward, Secretary of War, Edwin Stanton and some military officers) to try and convince them to adopt this new technology. While the military were not entirely convinced, the Austrian military had decided to switch to gun-cotton entirely and therefore, a lot of their Lorenz rifles designed for black powder were now available for sale. As a result of this, a large number of Lorenz rifles were purchased by both the Union and Confederate sides during the US Civil war, with the Union purchasing over 225000 rifles and the Confederates buying 100,000 rifles. In fact, the Lorenz rifle was the third most used rifle during the Civil war. However, Von Lenk's process was abandoned by Austria around the end of 1865, due to explosions in two factories and a fear about the stability of gun-cotton. Nevertheless, scientists in other countries were hard at work trying to improve on his processes. The next breakthroughs were by a Prussian artillery officer, Johann Edward Schultze, a French scientist, Paul Vielle and a British scientist, Sir Frederick Abel, and we will study about their discoveries in the next few posts. The discoveries of Schönbein soon attracted the attentions of many other chemists (mostly French and German), who investigated the properties and chemical composition and came up with different variants. Some of these names include the above mentioned Pelouze (who revisited his earlier research and came up with a new process in 1846), Dr. Knopp, Dr. Bley, Von Kirchoff & Reuter, Porret, Teschemacher, Walter Crum and Dr. J.H. Gladstone. In England, a company called John Hall & Sons Co. bought the patent rights to manufacture gun cotton from Schönbein in 1846 and built a new factory to do so at Faversham in early 1847. Unfortunately for them, the process and its associated dangers was not fully understood and a few months later, on 14th July 1847, there was a huge explosion that destroyed the factory and killed many workers, leading to the factory being closed soon afterwards. The manufacture of gun cotton was not attempted in Faversham again until 1873, when a different company opened a new plant at a new location outside town. But this was not the only tragedy -- only a year later, on 17th July 1848, 1600 kg. of gun cotton exploded in a factory at Bouchet near Paris. This explosion was so powerful that walls from 18 inches to a yard in thickness were reduced to powder, and heavy weights were hurled to great distances. These and other accidents, caused the French and German governments to appoint committees to study whether manufacturing of gun cotton was worthwhile or not. After 6 years of experiments, the French Commission reported that, "In the present condition of things, there is no use in continuing the experiments in relation to employment of gun-cotton in warlike arms." However, all was not lost. Over in Austria, an officer named Wilhelm Freiherr Lenk von Wolfsberg (also known as Baron von Lenk and Von Lenk) was conducting his own experiments in 1849 on behalf of the Austrian military. Von Lenk was serving in a Field Artillery regiment when he began his experiments and he discovered the cause of the previous failures. He came up with a process of manufacture that was both safer and profitable. Due to his researches, a factory "K. K. Ärarische Schießwollanstalt" was set up in Hirtenberg to manufacture gun cotton in 1851. This factory was later absorbed into a larger artillery arms company that still exists today, Hirtenberger AG. 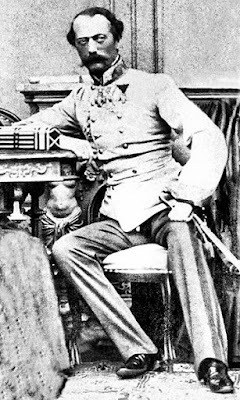 Major General Baron Von Lenk in 1865. Click on the image to enlarge. Public domain image. The gun cotton should be thoroughly purified afterwards and every trace of free acid should be removed. This was done by washing the product in a stream of water for several weeks; subsequently a weak solution of potash could be used as a final wash, but this wasn't essential. We will study more details about the Von Lenk process in our next post.